Brilliant Bournemouth secured another wonderful away day as they cut through Fulham to win 3-0 at Craven Cottage. Goals were expected from the game and inside a quarter of an hour Callum Wilson converted a penalty he had won himself to give the Cherries the first-half advantage. With less than 20 minutes to go a superb visiting counter doubled the lead, Ryan Fraser's precise through ball finished with confidence by David Brooks through the 'keeper's legs. Cottagers skipper Kevin McDonald was dismissed moments later for a second yellow, and in the closing stages Wilson slammed home his second from another brilliant Fraser pass, the away end bringing out the 'ole' cheers as their side confirmed another fine afternoon on the road. The Cherries were dealt a blow ahead of kick-off, Joshua King unable to feature due to injury, though Charlie Daniels came in following his own spell on the sidelines, his first start since the draw with Everton in August. Getting under way with a back three and Daniels and Adam Smith in the wide areas, Bournemouth began brightly with Wilson flicking Daniels' centre wide with his head. Aboubakar Kamara showed Fulham's attacking intent, however, when he back-headed a centre onto the roof of Asmir Begovic's net, Aleksandar Mitrovic also displaying his strength in holding off defenders. Fraser tested recalled Fulham 'keeper Sergio Rico's handling with a 20-yard effort, then, in the 13th minute, Wilson was bundled over in the box by Timothy Fosu-Mensah, referee Andre Marriner immediately pointing to the spot. With regular taker King absent, Wilson purposefully picked up the ball, soon rolling home centrally for his fifth goal of the season. The Fulham fans wanted a penalty of their own soon after, Kamara going down but being booked after he had attempted to hoodwink the officials with a dive. The always attack-minded Andre Schurrle struck from 21 yards and forced Begovic into a strong-handed block, Fulham maintaining their forward threat, and seven minutes before the break Denis Odoi headed wide from Jean Michael Seri's corner. The Cherries needed to defend two corners to end the half, but retained their advantage to the interval. No changes for the second half, Ryan Sessegnon soon tricking his way into the box but not able to find a team-mate as his low centre rolled across the danger zone. The home side had started the half on the front foot, but Rico had to make a fine diving save when Simon Francis ran onto Lewis Cook's pass and lasered in a shot that was heading into the top corner at some velocity before the 'keeper's intervention. 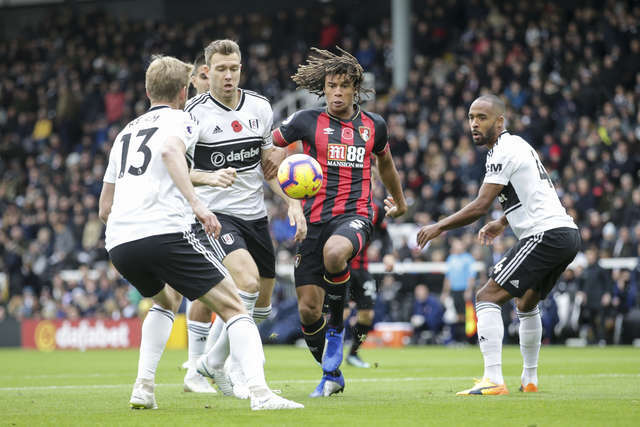 Slavisa Jokanovic rolled the dice for the first time in replacing his left-back with the more attacking Tom Cairney on the hour, while the Kamara-Nathan Ake dual continued down the Fulham right, the Cherries defender remaining on top with 20 minutes left to play. The Fulham pressing resulted in space at the back and it was ruthlessly exploited as Bournemouth extended their lead on 71 minutes. Lewis Cook sped out from defence, Wilson toe-poked the ball on its way to Fraser and the Scot powered towards the home box. Brooks provided the run and Fraser's ball was perfectly weighted for the former Sheffield United man to finish first time, delightfully slipping the ball between Rico's legs before celebrating his third Cherries goal with the 2,600 massed away fans. McDonald soon made Fulham's comeback task all the harder by tripping Brooks for his second yellow card of the half, any lingering hopes extinhuished when Wilson capped the afternoon with a well-taken third. Fraser fed in the striker with a perfectly-spotted assist and Wilson did the rest as he rifled past Rico as he hit his half dozen for the campaign. The visitors held their advantage to the end to claim a second successive away win with a margin of seven goals scored and not a single one conceded. Eddie Howe has shown an ability to change his formation this season, and reverted to three at the back from the off at Craven Cottage. It's a set up that has been seen regularly against the top six, but against the Cottagers allowed for pace from the flanks in attack, while the extra man in the middle allowed defensive support when attempting to negate the physicality of Mitrovic. The shut out in the capital was Bournemouth's third straight Premier League clean sheet, the feat matching that of last November and, as it did 11 months ago, winning seven precious points. Coupled with the system which seemed to outfox the Cottagers from the outset and a ruthless attacking streak also seen last time on the road at Watford, Bournemouth secured a fine result from a terrific away performance to secure their 20th point after just the ten games.